Aguilar has once again raised the bar. Neutral sound that still manages to be rich and detailed. A headphones out would have been a useful inclusion. Talk about aspirational bass amplification and you’ll soon be talking about Aguilar. Based in the artsy Soho district of Manhattan, it produces some of the most desirable bass amplification, speaker cabs and effects pedals available today. It all started back in the mid-90s with a preamp designed by freelance bassist Dave Boonshoft and engineer Alex Aguilar, who had previously collaborated with Roger Sadowsky on his bass guitars’ preamps. Boonshoft wanted a preamp specifically designed for bass guitar, which had the kind of versatility that he’d experienced as a studio bassist. Although Alex later left the company he’d given his name to, the preamp he helped design and the amp it was used in - the DB680 - were the first in a range of superb bass amplifiers from Aguilar. Building on this heritage is the new Tone Hammer 700. The compact black steel case and classy silver-grey front panel are features of all three amps in the Tone Hammer range. As you may know there’s a 350 and 500 available too, both of which have been a huge success with working bassists since they were launched. The front panel controls of the Tone Hammer 700 give the amp an uncluttered and logical layout. The EQ has just Bass, Mid - with separate level and frequency controls - and Treble. Things get much more interesting when you add the Drive control; this works interactively with the Gain giving you more of a vintage, tube-type EQ response. At low gain settings, the applied EQ is flatter, while cranking the Gain up gives you smoother trebles and a tighter bass. By adjusting the Gain and Mid frequencies together, there’s a wide sweep of vintage style bass tones available. The Drive works around the midrange frequencies, with a warm, organic harmonic distortion that adds punch, depth and colour to the sound. This all translates to an amp which has far more depth and potential than it seems. You could take the amp out of its box, set the EQ flat, plug in your bass and enjoy a great sound straight away. We did just that, and it was tempting to leave everything alone when we heard just how good my bass sounded. The Bass EQ control is set at 40 Hz, which is very low and adds body and depth to your tone rather than muddying the sound up. Likewise, the Treble control has a specific brightness and presence that adds zing to slap lines and a focused edge when playing with your fingers or a pick. However, it’s the quality of the midrange sounds that really stands out. Spend some time understanding the subtle effect that the Drive and Gain controls have on the midrange frequencies, and you can fine-tune your tone until you have exactly the bass sound you’ve been striving for. It’s worth mentioning here that this Tone Hammer preamp is also available as a separate DI box. It’s one of the best of its kind, and remarkably inexpensive given its specifications. It’s pretty obvious that the Tone Hammer 700 is designed and built by experienced bass players. As well as its superb sound, this is also evident in other, more practical ways. For instance, many of the features usually relegated to the back panel are on the front, meaning that items like the effects loop, the balanced line DI (switchable for pre or post EQ) and even the ground lift switch are all easily visible and accessible, even on a dark stage. Further evidence of the amp’s pro gigging credentials are the impressive built-in safety features. Should the sound engineer or FOH guy accidentally send 48 volts of phantom power through the DI, there’ll be no harm done to the amp. Also, you can run the unit safely without speakers attached. Even messing with the EQ and cranking up the bass’s volume to the extent that the clip light is going crazy will cause no damage to the amp at all - although your speakers might not thank you! 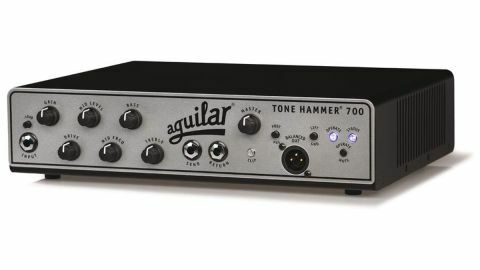 This new elder sibling of the Tone Hammer range is one of Aguilar’s best offerings to date. It has used a powerful Class D amp module with a switching mode power supply, which is accurate, noiseless and reliable - but then again, so have other amp manufacturers. For us, the thing that sets this amp above many other bass amps available today is the quality of its preamp, and in particular its EQ. Accurately amplifying a bass guitar is one thing, but providing the tools for shaping its tone - the sound that you hear from your on-stage monitoring, speaker cabs or studio monitors - is what presents the real challenge. This is an amp that’s defined by its preamp, and it’s a rare thing indeed to find one as good as this.